Do Time 4 Diamonds provide warranty? Yes, all items purchased from Time 4 Diamonds come with warranty as standard. This will supersede any manufacturer's warranty on bespoke or customised pieces. We also offer extended warranty if required, prices may vary for different timepieces and jewellery. For full details about our warranty service please do not hesitate to contact us. Do the watches purchased from Time 4 Diamonds come with box and manufacturers papers? Yes, all items purchased from Time 4 Diamonds come with box and papers, unless stated otherwise in the individual listing of the watch. All bespoke / customised pieces come with a Time 4 Diamonds warranty card and certificate. Is Time 4 Diamonds an authorised dealer for any brand? While Time 4 Diamonds are not an authorised or direct dealer for any brand, all of our products originate from authorised dealers and respected industry wholesalers. All trademarks are owned by their respective brand owners. What do you mean by unworn or pre-owned unworn? 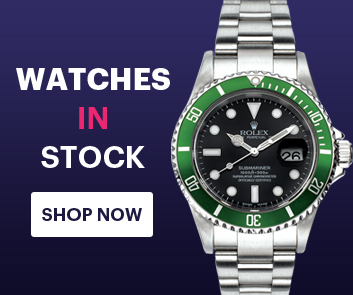 If a watch is described as unworn or pre-owned unworn we mean that the watch has been recently purchased new and subsequently purchased by us without having been worn. Unworn watches will have all protective stickers and seals (where such wear seals are utilised by the manufacturer) still present. Is it possible for Time 4 Diamonds to customise a watch I already own? Yes, we are able to customise a watch you already have. We do however recommend that you allow us to supply the completed watch fully personalised to your requirements, as only then we are able to provide you with warranty on the watch. Do you accept watches in part-exchange? We are always happy to offer our customers the option of part-exchange where possible if you have something of interest to us. If you have a watch to part-exchange, please feel free to contact us with the full details of the watch and if the watch is of interest to us then we will get back to you with a part-exchange valuation. For further details, please visit the "Selling Your Watch" section on this website. Is it possible for you to hold an item for me for a few days? Yes, Time 4 Diamonds are always happy to take an item off sale if a customer needs time to arrange full payment or make arrangements to collect / deliver goods. This deposit is typically 20% of the value of the product but can vary so please call. Bankers Draft: We will only accept a bankers draft if the draft is presented within business hours and authorised by your issuing bank. Credit card: We accept all major credit cards (except AMEX and Diner), we also require additional proof of ID* to be faxed to us in the case of cardholder is not present during the (CNP) transactions. Please note all CNP transactions are limited to an amount of £500 GBP. All credit card payments will attract a 2.5% handling charge of the total balance. Debit card: We accept debit cards although we also require additional proofs of ID* faxed to us in the case of cardholder not present during the (CNP) transactions. Please note all CNP transactions are limited to an amount of £500 GBP. There is no extra handling charge for debit card transactions. Personal / business cheque: Subject to 10 workings days clearance after the cheque is cashed. 1) A passport or driving license. 2) A household utility bill. 3) A scan of both sides of the card used for payment. 4) A signed letter of authorisation from the card holder. How are goods delivered and how long will it take? We aim to have the item dispatched within 24 hours of receiving cleared payments, so long as the item ordered is in stock. For items which are not in stock order times can take longer in some cases up to 30 days. Please contact us if you would like to check the approximate order time, if you are unsure. The delivery time can vary for different locations, however as we aim to ship all items within 24 hours of receiving cleared funds, most locations around the work will receive item within 1-3 working days. Please note due to each country having its own custom procedure this can vary, and so should be used as a guide only. If you would like to check the availability of your chosen item before purchasing please contact us. Do you service watches even if they haven't been purchased from you? Yes we do. If you have a watch which you would like to have serviced at Time 4 Diamonds please click here for more information. The watch will be repaired by our watchmakers and can typically take 2 weeks to complete. Our charges are very competitive too. For details please visit our "Watch Servicing" section of the website.